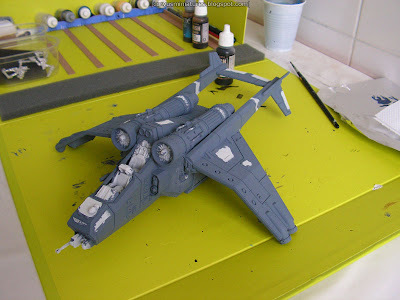 The majority of the aircraft has been basecoated. This was done with two layers of Vallejo Model Color's Mirage Blue Grey. This color covered very well, so I could make it quite thin and only use two layers. Finally a tutorial about green stuff that makes me think "hey, maybe I can do this too". Head over to the DakkaDakka forums and read this post. Some of the topics covered are robes, ropes and purity seals. It's the winner of their recent tutorial competition. You can see the other winners here. Coming in September: the new Warmachine faction called Retribution. A while ago the first concept arts appeared and I was very curious about how Privateer Press would fit the more sci-fi and angelic theme into the existing universe. Today the first pictures of painted figures are released: Tabletop Gaming news has a good overview of all of them. The design is a mix of the existing warjacks (the proportions) together with some Eldar and PanOceania (army from Infinity) influences (the armour). I think the overall look is right, but some pieces of armour are just too bulky and look very plain. Also, the white color scheme is very boring if you ask me. The characters look ok, but don't really fit into the theme of the warjacks. To be honest I expected a bit more from Privateer Press, but I think it's very brave of them to introduce a completely new faction into a game which is a few years old.